When you have a child who needs a little extra care, or presents more of a challenge, you can easily feel isolated and different. Many other parents can’t understand the anxieties and concerns that you live with. Take 5 & chat – parenting additional needs began in March 2015 – as a Facebook Page. I hoped that it would represent a safe place for parents to be, somewhere to drop in and to help you feel less isolated. A place where you can surround yourself with people who get it. By ‘additional needs’ we mean any extra condition that your child is living with, for example: – medical or developmental issues, physical, behavioural or emotional difficulties – or learning problems. There doesn’t have to be a diagnosis. Anything that means your child needs extra care. 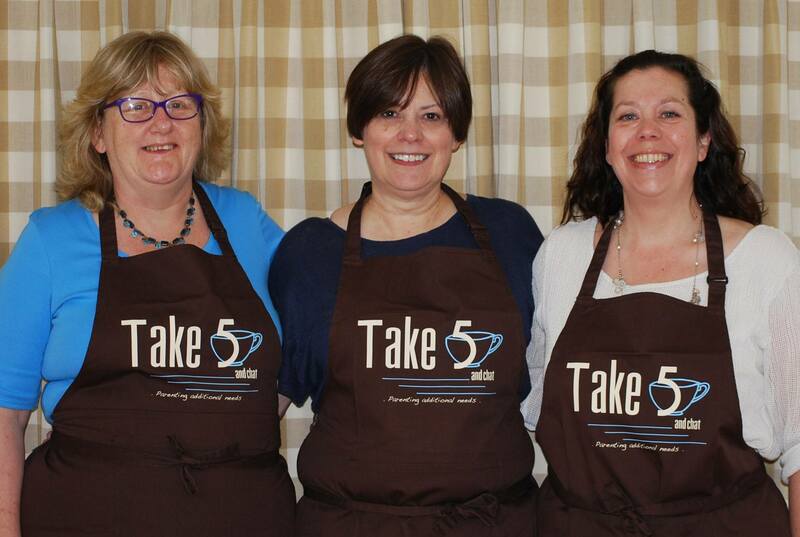 By May 2015 the initial team had been trained and was ready to set up and run Café Drop-in sessions in Whitley Bay. The Drop-in hit the ground running and we quickly became known in the area as a great place to be. Our hot drinks and homemade cakes created the café atmosphere we wanted, it’s a simple but effective idea! We run fortnightly, all year around, including school-age children during the school holidays. We are now encouraging others to set up and run Café Drop-in Sessions in accessible community buildings for the sole purpose of providing support and encouragement to those parenting/caring for children with additional needs. This web site is a place where you can find out more about our Café Drop-in model, read articles from other parents, see a little about the parent-led courses we run and, if you wish, get in touch with us. The Facebook page, where it all began, is still our main way of keeping in touch so please like us on www.facebook.com/take5andchat and follow us on https://twitter.com/take5andchat !